This tube is a "PROFESSIONAL SPECIAL QUALITY" Premium Quality Ultra RARE "Gold Pin" Audio tubes. Authentic Siemens Western Germany with number on bottom between the gold pins. 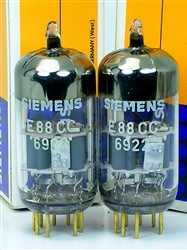 Some of the FINEST GERMAN 6922 tubes one can find! Sonically Brilliant, Pristine, Musical & Theraputic. All Pairs Balanced & Matched @ 100% to115% mA @ fixed bias mode! CERTIFIED ULTRA-LOW NOISE PLATINUM-GRADE. Pictures of some of the Actual Tubes - boxes displayed not included however, includes newer authentic Siemens replacement boxes for FREE! Tube printing will vary as this is a multiple quantity offer. 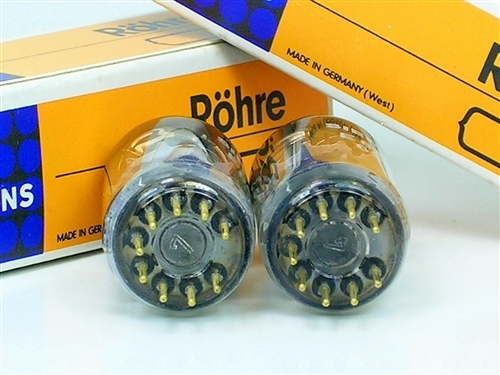 All these silver-shield tubes have the identicle inner-construction as the picture above. "...Thank you for your message. As you know, tubes in general need to settle-in to the new environment, and get better with 'burn-in'. With the Siemens Halske E88CC you are going to hear ALL the frequencies passing through your system, the more sensitive the tube the more you will hear. You are using AUDIO GRADE tubes with the Siemens E88CC, which have a sonic-signature that reproduces not only the 'odd'harmonics (1-3-5 etc.) but also the 'even' harmonics (2-4-6 etc.) The new tubes made today in China and Russia only reproduce 'odd' harmonics - thats why everyone upgrades to a vintage made tube made decades ago when these rare 'earth-metals' were available in the inner construction of the vintage tube - now these metals are too expensive to use and todays tube-makers have found cheaper substitutes which seem to work but do not reproduce all the nuances and textures in music. ..."
"... This tube is known for excellent performance, smooth highs, outstanding 3-D holographic soundstage, lots of open-air, inner detail, and overall perfect resolution and balanced sound. Improved dynamics, frequency extension accross the spectrum are immediately obvious, making the music sound much more accurate and real. A major improvement over other E88CC / 6922..."
"... Fast and accurate! Great seller! "...5 STAR RATING GUYS...Mark your communication, price and delivery was great!!!! !